Short and squat. Note the odd bulges – the dough kind of “exploded” out the sides! From some reading that I’ve done, this could be the result of the dough sticking to something during proofing (my batard did), not letting the loaves rest long enough after final shaping, or not slashing the them deeply enough. First, let me thank Breadchick Mary (The Sour Dough) and Sara (I Like to Cook) for selecting this wonderful classic recipe from Mastering The Art of French Cooking, and for typing out sixteen pages of instructions! You can find the original recipe here, and I encourage you to check out the Daring Bakers blogroll to see how everyone else did. I loved this challenge because it really pushed me outside my comfort zone. In other words, it truly was a challenge! 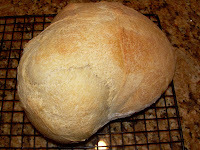 I had never made French bread before (I think my mom and I may have made it once when I was very young), and I learned so much from the problems that I encountered and the techniques that I learned with this bread, that I was able to tackle the Bread Baking Babe’s Royal Crown’s Tortano. My house is pretty cold – we keep it at 59 degrees F. If I close the doors of my kitchen, I can get it up to the low 70s in there. This is supposed to be a great environment for bread baking. In retrospect, however, I may have made the kitchen warmer than I thought, leading to me over-proofing the dough. I weighed my ingredients (using King Arthur Unbleached AP flour), mixed them together, then decided to knead by hand (e-GADS). That last step took about 20 minutes. 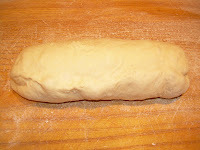 If you ever want to get into bodybuilding, exercise your upper body by hand kneading dough. I wasn’t sure when to stop, and may have overdone it, so I have a question for you more experienced bread bakers: can you overknead dough? The first rise took three hours, but the “dome” looked a little flat. 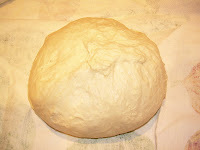 At the time, I almost let the dough proof longer because I thought it had not yet formed that puffy dome. Now, I think it may have formed the dome, and was starting to flatten out. The second rise took only one hour. After I shaped the loaves, they barely rose at all; a couple of Daring Bakers noted that may be a sign that the yeast has run out of food. 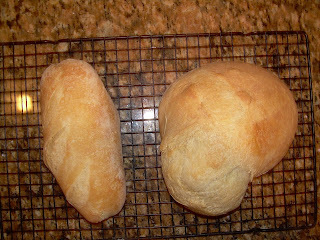 The loaves had also developed a strong yeasty smell, and I had only enough dough for two loaves! I baked them on a baking stone, sprayed them with water, and had a pan of steaming water on the floor of the oven. Though oddly shaped (the round bread reminded me of the movie “Alien,” for some reason). The crust was crisp, and the bread actually had body, unlike a lot of supermarket French breads that are very fluffy inside. 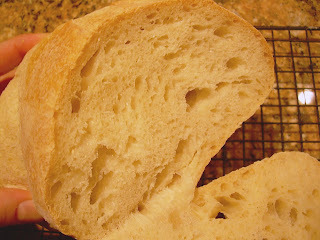 And the flavor was very nice; the loaves actually tasted like a mild sourdough. I learned so much from this Challenge, that I’m already applying it to other breads. I plan to tackle this recipe again in the future, but this time I will knead by machine, get an idea of what the dough should feel like, and watch the proofing. Many thanks to Mary and Sara. Some additional info: (1) For those of you who may be interested in a fancier steam contraption for your oven, see this post by Rosy Levy Beranbaum. (2) In his book, Local Breads: Sourdough and Whole-Grain Recipes from Europe’s Best Artisan Bakers, Daniel Leader recommends King Arthur Organic AP flour as the one that most closely emulates French 55-type flour (I didn’t use this, I used AP flour per the recipe, so I can’t vouch for it). But while perusing the website, I discovered that King Arthur now carries a French-style flour. Woo-hoo! Even if your bread did look like it came from a bakery in France it is still enjoyable to eat and what you (and I) learned is priceless. That is really nice looking pain francais, Madame Chow! It looks just right and I think it is wonderful. Now, see, you still have your mojo. And the shapes? Call them ‘rustic’ or ‘artisan’ and you’ll be fine! I agree with Judy. Rustic french bread is all the rage. Great job! 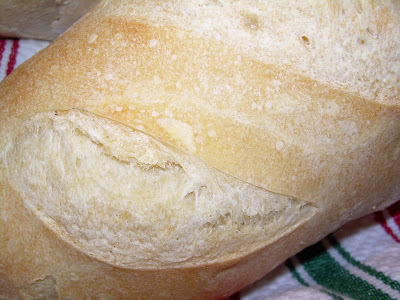 You loaves look perfect from a crumb standpoint even if they didn’t quite have the “beauty” you hoped for. I am so glad you enjoyed this challenge because I sure enjoyed baking with you this month. You can join me baking bread anytime! thanks for participating with Sara and I! This is such a cool bread you had baked! mine was a bit burnt! but it was worth it! lol! I kind of like what your bread did, almost like it had taken on a life of its own. Nice job on this challenge, and it sounds like you learned quite a few lessons to apply to other recipes! I made some bread a little while ago (not this French bread) that became dis-formed like that, and I’ve been wondering what happened! Regardless, it looks wonderful and tasty! It looks wonderful to me! Thanks for baking with us this month. I love how our bread turned out. Looks are deceiving…as long as they tasted good…that’s what matters!